FLIP is short for 'Floating Instrument Platform' it is one of the US navy's oldest and most interesting pieces of marine research equipment. It is also referred to as 'flip' because of it's unique ability to flip from a horizontal position to a vertical position. The transition takes 28 minutes and is achieved by pumping seawater into one end of the boat and flooding air into the other end so it rises out of the sea. 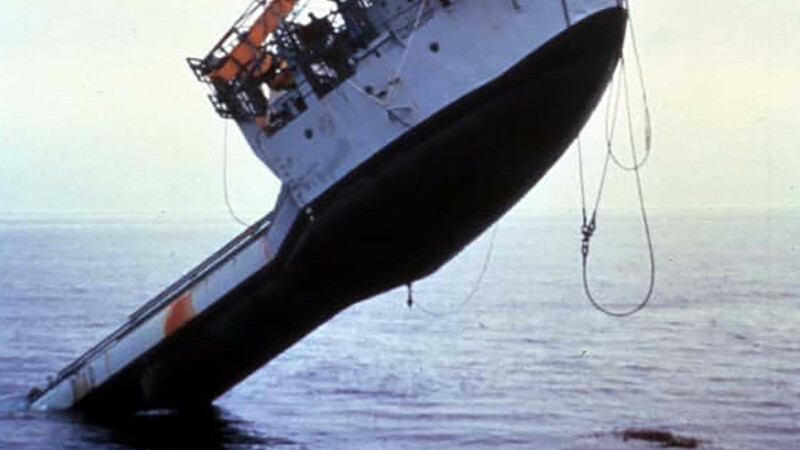 FLIP was designed by scientists Dr Fred Spiess and Dr Fred Fisher in 1962, their aim was to design a ship that could provide a more stable base than conventional ships for the purpose of studying wave forms. It is the only vessel in the entire word that is capable of operating both vertically and horizontally. FLIP has no engines and it has to be towed out to sea, this is because of the potential for interference with important acoustic instruments that are required to operate with precision. It can operate in deep and shallow water and is fitted with three anchors so that it can be held in place when necessary.